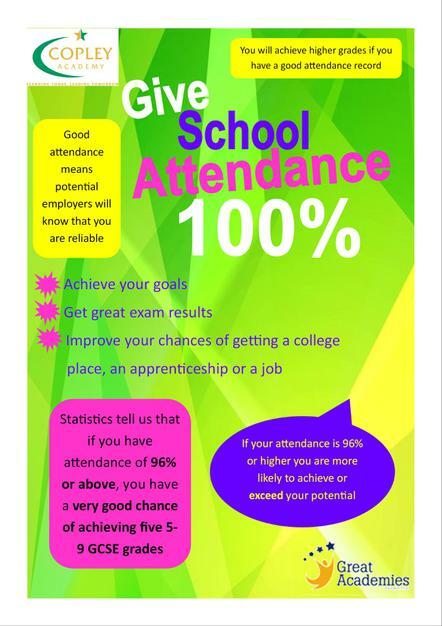 Good attendance and punctuality are absolutely essential if students are to make excellent progress and achieve highly in lessons. 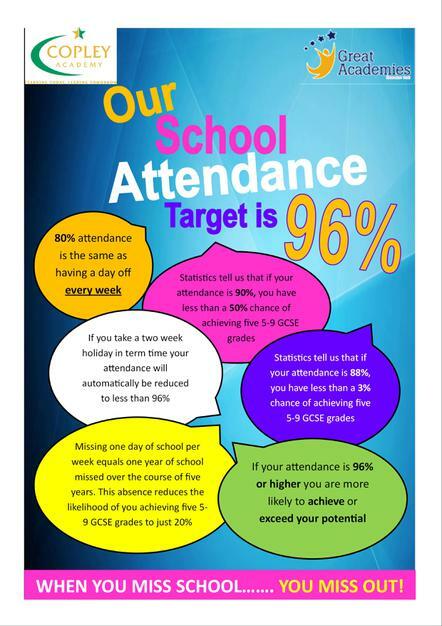 The target attendance percentage for each child is 96% and we expect all students to be on the school site by 8.30am every day. If your child is ill, you must inform us as soon as possible by telephoning before 9.00am or sending a note. The school will text you or contact you by phone if your child is absent from school without explanation. They will text/ring you during the morning where possible. 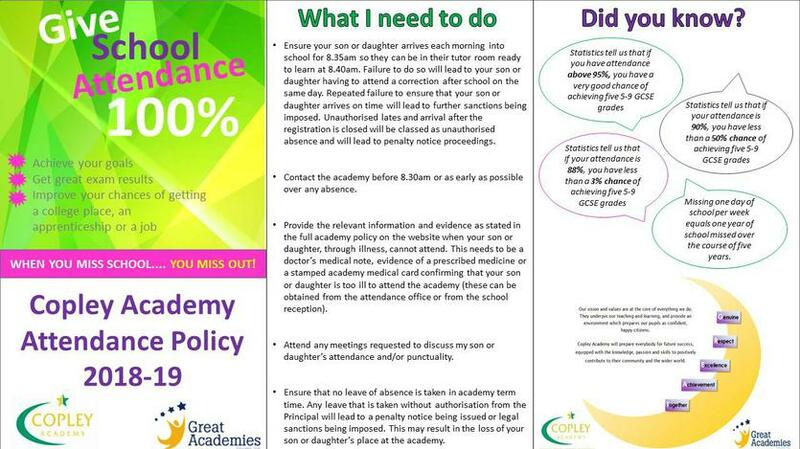 If your child’s attendance or punctuality drops below our targets then you will be expected to attend one of our half termly Attendance/Punctuality Panels which are supported with our Educational Welfare Officer (EWO). This panel will allow us to work together to ensure attendance is improved and academic progress is back on track. 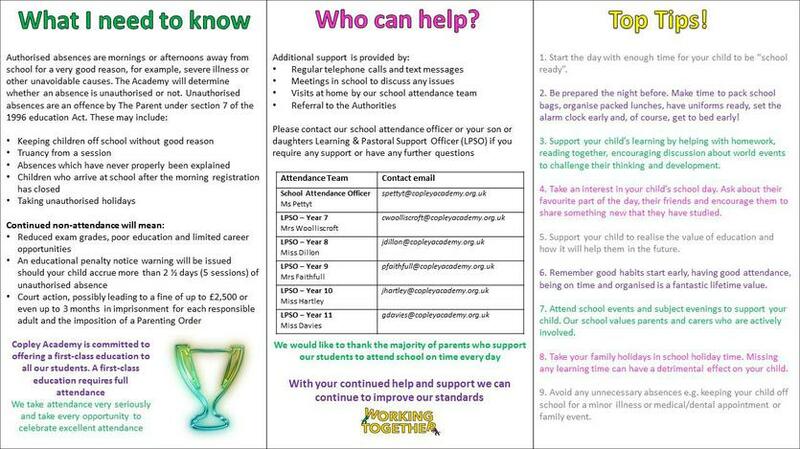 If your child’s attendance falls to 90% or below they are classed as a Persistent Absentee. Any student who falls below this figure (without an official medical explanation) will be immediately passed on to the EWO and pursued vigorously by all means available to the school. The Department for Education (DfE) has announced significant changes to legislation in relation to leave taken during term time. The law now says that Principals may not grant leave of absence during term time unless they are satisfied that the circumstances are exceptional and warrant granting the leave. A holiday during term time will not be classed as exceptional (DfE September 2013); No term time holidays will be authorised. However, parents who find themselves in very exceptional circumstances regarding holidays may ask the Principal. This decision is totally at her discretion and will not exceed 5 days. Please be aware that parents may receive a Penalty Notice fine from the Local Authority for taking their child out of school during term time without consent from the school. A Penalty Notice fine for Unauthorised Leave during Term Time can be issued without warning if a student is absent for a period not agreed or authorised by the Head teacher. This will be for an absence of a minimum of 10 sessions (5 school days) and relating to leave of absence during the term time. The fine is £60 per child per parent if paid within 21 days and £120 if paid between 22 and 28 days. Failure to pay the fine could lead to prosecution in magistrate’s court. As a school we must be able to account for all student absences throughout the academic year and be able to justify them to the Local Authority. All schools are expected to take appropriate actions to ensure parents are aware of the change, to adopt firm policies and processes to ensure the impact of this legislation is to reduce authorised absences during term time. We fully appreciate the financial implications this might have on families taking holidays, particularly during school holiday times and we align our school holiday dates with those of Tameside to help with this.